The study examined Norway spruce (Picea abies) saplings morphological and biomass sensitivity to ozone fumigation using closed indoor chambers of controlled environment. 4-year-old potted saplings were exposed to three different ozone concentrations: 80 µg/m3, 160 µg/m3, and 240 µg/m3 (7 h/day, 5 days/week). Half of the saplings were harvested after the exposure, and the second half of the saplings were left in the pots in open field until next autumn. The reaction of the saplings of different timing of bud burst was also investigated. The terminal shoot length and the total current year shoot length of Norway spruce saplings after one month of ozone fumigation were significantly (p<0.05) suppressed in all the treatments comparing to the control saplings. The needles of saplings fumigated with ozone were smaller than the needles of control saplings. No significant changes of the biomass of different fractions of Norway spruce saplings were determined right after the fumigation, as well as, in 14 month after the cessation of the fumigation. Norway spruce saplings of early and late timing of bud burst reacted differently to ozone fumigation during the active growth period. The formation of new needles and shoots of the saplings of late bud burst stage was more suppressed comparing to the saplings of the early bud burst stage. The results suggest that the generatively younger organs during their formation are more susceptible to ozone stress. The differences of the needle age between ozone affected and control saplings decreased in one year after the end of fumigation keeping affected Norway spruce saplings in the open field and thus indicating the start of the recovery process. Field surveys of ozone symptoms on spontaneous vegetation. Limitations and potentialities of the European programme. Environmental Monitoring and Assessment 115: 335-348. Submanual for the assessment of ozone injury on European Forest ecosystems. Web site. Visible foliar injury and physiological responses to ozone in Italian provenances of Fraxinus excelsior and F. ornus. TheScientificWorldJournal 7 (S1): 90-97. Measuring, modelling and testing ozone exposure, flux and effects on vegetation in southern European conditions - What does not work? A review from Italy. Environmental Pollution 146: 648-659. The global consequences of increasing tropospheric ozone concentrations. Chemosphere 22 (7): 685-695. Can plant traits be used to explain differences in ozone sensitivity between native european plant species? In: “Critical levels for ozone - Level II” (Fuhrer J, Achermann B eds). Environmental Documentation No. 115, Swiss Agency for Environment, Forest and Landscape, Bern, Switzerland, pp. 83-87. Spatial and temporal variability in ozone concentration level at two Lithuanian stations. Water, Air, and Soil Pollution 130: 1547-1552. Ozone effects on forest vegetation in Europe. In: “Effects of air pollution on forest health and biodiversity in forests of the Carpathian mountains” (Szaro RC, Bytnerowicz A, Ozslányi J eds). Series I: Life and Behavioural Sciences - Vol. 345. IOS Press, Amsterdam-Berlin-Oxford-Tokyo-Washington, pp. 43-49. Ozone and broadleaved species: a guide to the identification of ozone-induced foliar injury. Ozon, Laubholz- und Kraupflanzen: ein Führer zum Bestimmen von Ozonsymptomen. Haupt, Bern, Stuttgardt, Wien, pp. 11-19. Ozone exposure-response relationships for biomass and root/shoot ratio of beech (Fagus sylvatica), ash (Fraxinus excelsior), Norway spruce (Picea abies) and Scots pine (Pinus sylvestris). Environmental Pollution 109: 473-478. Ozone exposure results in various carry-over effects and prolonged reduction in biomass in birch (Betula pendula Roth). Plant, Cell and Environment 22 (11): 1401-1411. 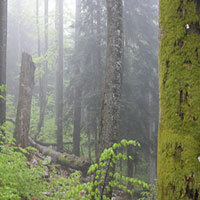 Impacts of air pollution and climate change on forest ecosystems - Emerging research needs. TheScientificWorldJournal 7 (S1): 1-8. Impacts of ozone on forests: a European perspective. New Phytologist 139: 109-122. Effects of ozone on frost resistance, growth and carbohydrate status in Norway spruce seedlings (Picea abies). Aquilo 29: 51-68. Effects of air pollution on forest health and biodiversity in forests of the Carpathian mountains: an overview. In: “Effects of air pollution on forest health and biodiversity in forests of the Carpathian mountains” (Szaro RC, Bytnerowicz A, Ozslányi J eds). Series I: Life and Behavioural Sciences - Vol. 345. IOS Press, Amsterdam-Berlin-Oxford-Tokyo-Washington, pp. 3-10. Manual on methodologies and criteria for harmonised sampling, assessment, monitoring and analysis of the effects of air pollution on forests. Programme Co-ordinating Center, UN/ECE, Hamburg, Geneva, pp. 2-40. The condition of forests in Europe. 2004 Executive report. UNECE, Geneva, pp. 51. Impact of increased springtime O3 exposure on Scots pine (Pinus sylvestris) seedlings in central Finland. Environmental Pollution 109: 479-487. O fenologii drevesnyx porod v Karelii i metodie uchiota intensivnosti cvetenija i plodonoshenija sosni i jieli. Voprosi liesovedenija i liesnoj entomologii v Karelii. Moskva-Leningrad, pp. 42-48.